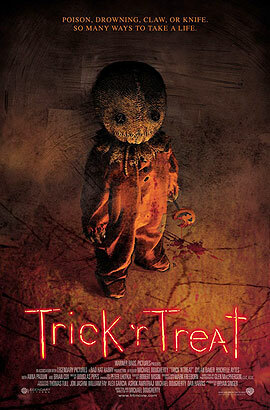 Samhain – Trick R Treat (2007) Trick r Treat is a classic Halloween film that has gained a lot of momentum and a strong cult following since it’s limited 2007 release. It follows the Creepshow format of stringing together separate short stories through out the film, though they hold a common thread. That common thread comes in the petite terror that is Sam (Samhain.) Sam is an almost benevolent figure. As long as you proudly display your carefully carved Jack-o-Lantern and done a Halloween disguise, Sam is happy. But if you don’t, look out! Terror Factor – Sam is sweetly terrifying, his small stature and his weapon of choice, a slightly gnawed on pumpkin lollipop, means he can pack an unexpectedly big terror punch. Costumability – A good Halloween costume has a certain amount of practicality. Sam has his priorities right, he’s comfortable in flat shoes for covering trick r treat ground, a warm jumpsuit to keep you cosy from the crisp, autumnal air, and a burlap sack that unstitches over the mouth so you don’t miss out on weird pumpkin beer. Icon Factor – Sam first appeared in an animation short Season’s Greetings in 1996, since then he has gained a true cult following with his own action figure and promised Trick r Treat sequel. This entry was posted on October 8, 2014 by coochiecrunch in Coochie Crunch Blog and tagged Halloween, Samhain, Trick R Treat.